The Inflation Monitor is a monthly report put out by Innovative Advisory Group. 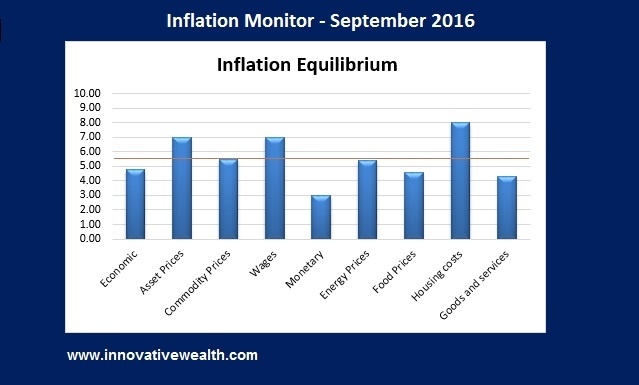 This monthly report is an analysis of inflation in the US economy and how it effects the economy. Happy New Year. I hope you enjoyed your holidays with lots of eggnog and holiday cheer. 2016 has started with a bang… or rather a thud. The US equity markets have had their worst start to the new year ever. I guess you could say that the thud has not happened yet since the US stock markets are still falling. The Chinese stock markets have gotten all the blame, but I think the drop in equities is overdue. In week one, S&P 500 (-6%), NASDAQ (-7.3%), and Dow (-6.2%). Gold surprised to the upside +3.1%. End of week two, S&P 500 (-8%), NASDAQ (-10.4%), and Dow (-8.2%). Gold is still up 1.8%. If you have been following this Inflation Monitor for the past year you will know my thoughts on the markets. 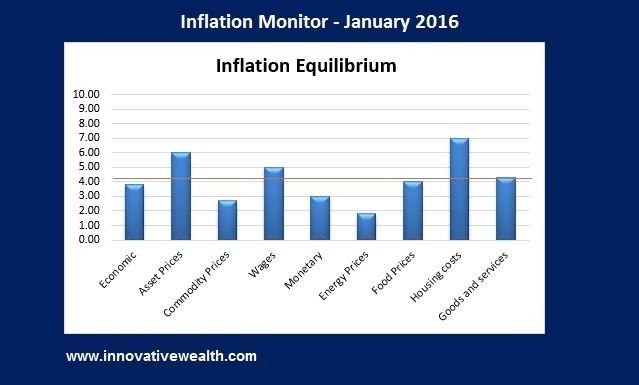 We saw strong deflationary data last year. Not surprisingly, no one noticed. The fact that it took the equity markets this long to react to this data is really the only surprise I see. This is the last issue of 2015. I hope you are enjoying the holidays and getting ready to bring in the new year. While this is a joyous time of the year. It should be used to reflect on the past year and what surprises are to come in the next 12 months. While no one can know the future, we can look for signs that things are not quite right. These are what I would call new potential risks to the equilibrium of the global financial markets. Why You Should Worry About Japan Deflation? Is the U.S. becoming Japan? 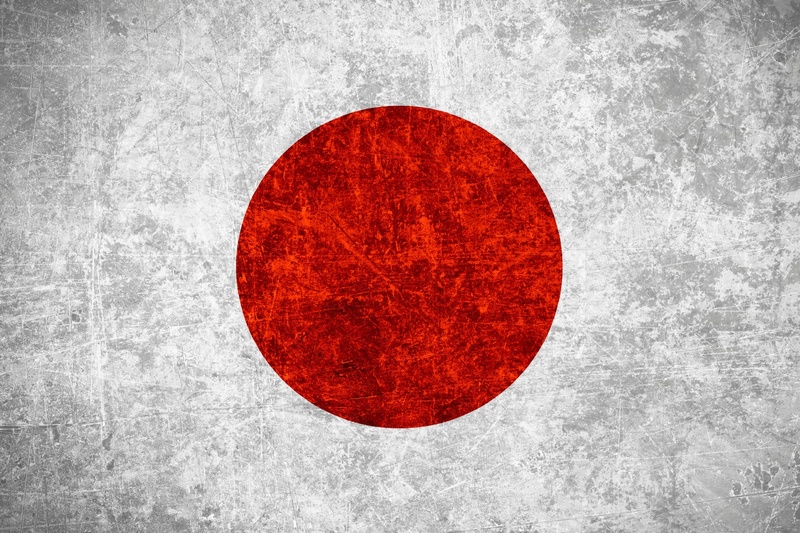 Japan has long been known as an example of what can happen when you allow deflation to happen in an economy which is highly reliant on persistent inflation to sustain itself. 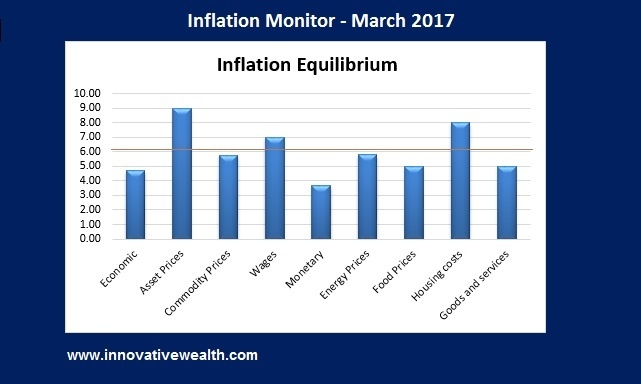 What is happening in Japan is one of the reasons that the Federal Reserve is trying so hard to avoid deflation in the US. Japan is in a challenging economic situation. This is mainly due to their demographics. They have an aging population, where the amount of elderly people is quite a bit larger than the younger generations. Anecdotally, in 2011 sales of adult diapers exceeded the amount for baby diapers.10. The chart below shows the demographics of Japan during 3 periods of time with approximately 50 years in between. 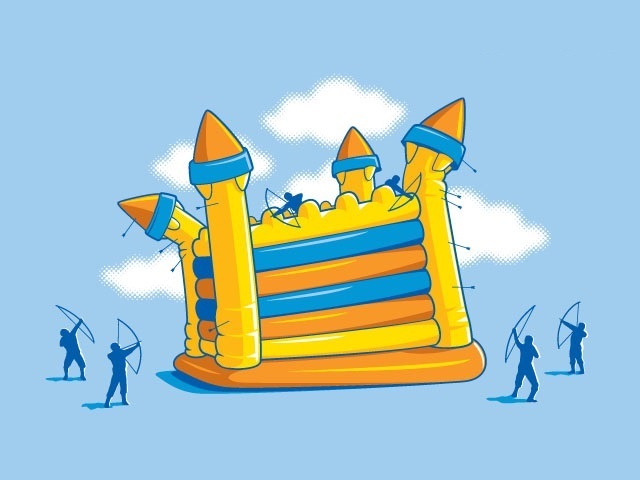 A shrinking population can become a problem in an economy because it is a strong deflationary force. 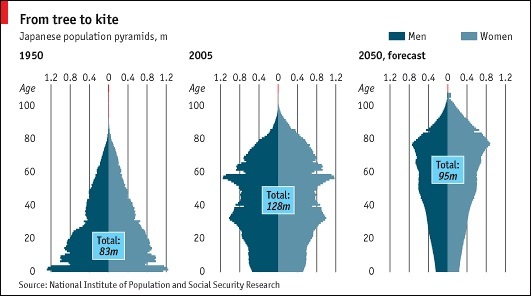 Japan has an aging population which will only continue to shrink over the next few decades. While other developed nations have stagnant or slow growing populations, this is not ideal for an expanding economy. Looking at the past year I have to give a hearty laugh at the people to claim that the US Dollar is losing value. I wonder if these people own a computer, or have bothered to look at the US Dollar chart. It is included below along with the chart of gold (which is a long gold/short US Dollar trade) and a few other important assets. The important thing to know about the US Dollar is that putting a value to it is complicated because it is a fiat currency. This means there are more than one moving variables that need to be accounted for to determine whether it is rising or falling in value. Take gold for example. Gold is a chunk of metal. People put a price on it of what they are willing to pay for it, but that is it. Its price is only determined what someone with a specific currency is willing to pay for it. Pricing an asset like gold is easy. Prior to being removed from the gold standard, the US Dollar was pegged to the price of gold, so there was an easy relationship which could be determined. Now let’s take a look at the current version of the US Dollar in comparison. The US Dollar is a piece of paper, but also a whole lot more. What is a US Dollar worth? The last month has been really interesting. My prediction seems to be coming true. I have stated for most of this year that the second half (3rd or 4th quarter) of this year would show the US entering into a recession. While I still believe that the US has a strong economy relative to the rest of the world. There are just too many factors bringing it down. The powerful people in this country as well as many academic economists have been pushing for a more global economy for a few decades. Now that we have a more global economy, it is more interconnected than ever. With the benefits of this type of system, come drawbacks. Having global booms and busts is one of those symptoms. Despite what the media personalities say on TV, the US is not an island. The US cannot decouple their economy from the rest of the world. I am not aware of this happening in any meaningful way for the past few decades. Prior to that, the global economy was not as interconnected, so any data would be less relevant. I have not looked at prior data, but I assume it has a similar theme to what we have now. What is important to remember is that the global economy is interconnected by money flows, relative currency valuations, asset valuations, inflation, jobs and many other factors. Most countries are dependent on one or more other countries for their economic prosperity. Unless the worlds nations decide to get into a economic battle as they did going into the great depression, this dependency will not change. 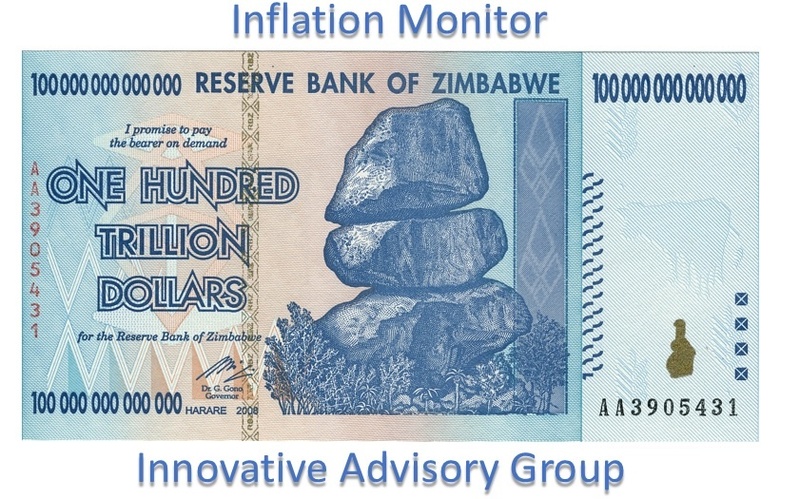 While this service is called the inflation monitor, it is important to discuss the economy as well since it has such an important bearing on inflation and deflation. 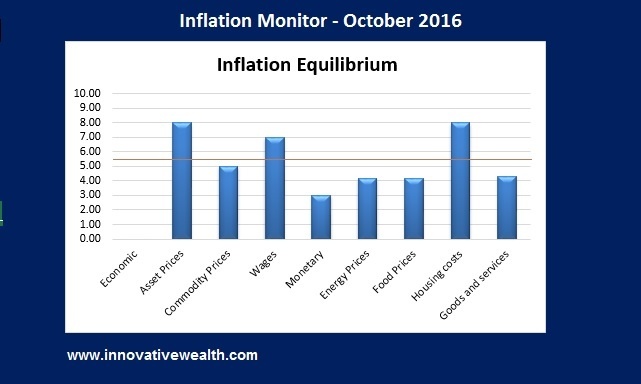 But as you know if you have been reading this for any amount of time, most of what is driving inflation or deflation at the moment is debt. I do not want to be hyperbolic, but the debt bubble that exists today is extremely dangerous and when it pops, a huge amount of wealth will be destroyed. While this bubble can be managed, as it has been up to this point, the Fed is not strong enough to control the global economy’s debt. There is one point I want to leave you with. Bear markets are dangerous, they are not a time to “make money”. The most important thing you can do in a bear market is to “not lose money”. Depending on the nature of it, this might be harder than you imagine. Logic does not always prevail in a bear market. 2008-2009 should have taught you that lesson, please go back and refresh you memory. This is the 12th issue of the Inflation Monitor. During the entire year that we have published this report, the trend has been deflationary. This is contrary to what many economists and fear mongers are claiming. the US has created an enormous amount of money and this should have caused inflation, yet other than the stock market, this is not the case. There are a number of reasons for this, but one thing is clear, the deflationary forces are strong and persistent. The lazy days of summer are almost over. As the summer ends, the Wall Street traders and money mangers will also be going back to work. If you looked at a chart of the S&P 500 without the dates, you would not be able to tell which days were summer days and which were not. It looks like the traders have been in vacation for the entire year. The S&P 500 has been fluctuating around 0% all year long. It is kind of refreshing to know that there is another direction other than straight up. 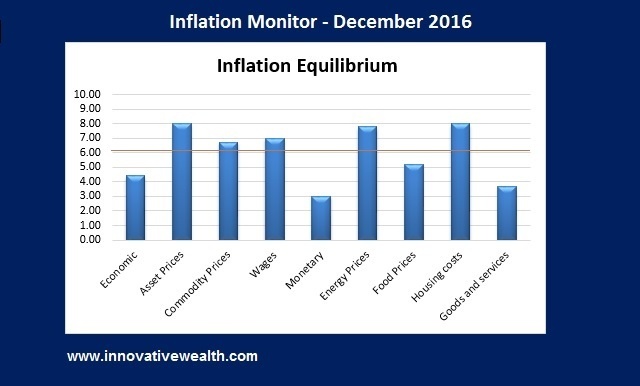 The end of the year has a chance to be very interesting considering the speculation that the Federal Reserve will be raising rates. While I have said many times I think the Fed will lock the floating rate of 0%-.25% at .25% as a starting point, this will amount to nothing. This might even be a catalyst for the market to resume its march higher, if the Fed says that they will stop and assess the markets reaction before raising again. The US stock market is already very overpriced according to a number of metrics, but until there is a better place for investors to put their money, it may remain expensive. The Chinese stock market has been unraveling in the past few months and this may be a catalyst to move global markets. It is too soon to tell. Keep watching Chinese markets as a sign of trouble ahead. The rise in interest rates has cast some interesting speculation on the future movements of the stock market. I want to dispel some of the myths about the rise in interest rates. In short, historical data suggests that the stock market rises with the rising rates, but what is not explained is that the rates start rising to stop the excessive rise in the stock markets. In fact in recent history, the Fed has raised interest rates until the stock market slows. Inevitably the Fed overshoots the mark and causes the market to decline. The US has had 0% interest rates since 2009. This is a long time with low rates. I am surprised the market is not higher. 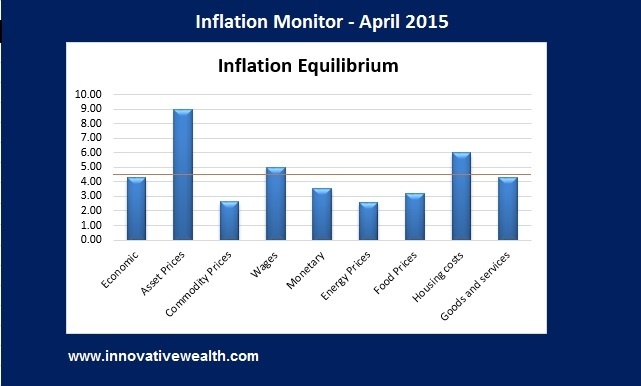 This month’s inflation monitor data once again show the US market is experiencing deflation. I have not heard more than a handful of people discussing this deflationary data. I am wondering when more people are going to recognize this fact. I suppose that will be when the markets turn, then everyone will have seen it. I hope you enjoy this month’s Inflation Monitor – August 2015. I hope you enjoyed your Independence Day. While Greece may not have the same appreciation of our holiday, they had one of their own… A Bank holiday. While the Greek Crisis in Europe seems to be solved??? The greater problem persists. The Greek people voted a resounding “NO” on the terms and the Greek PM moved forward with it anyway. Apparently Greece is happy kicking the can down the road, and I can’t blame them. They can never pay back the debt they owe and they are getting additional loans to pay the interest in the loans they already have. Europe seems to want to keep them in the EU for other reasons, but the end result is that they eventually will have to deal with this. I’m sure the politicians would rather this problem breaks loose on someone else’s watch. Everyone wins by prolonging this and everyone loses eventually by letting this happen. The US Markets continue to be quiet with no additional QE and a prospective tightening in the near future. The economy continues to be strong, but some signs are cropping up in small amounts showing that caution is warranted. I have added a few charts to this issue that I found interesting this month. I hope you enjoy this month’s Inflation Monitor – July 2015.